Home » Mumpreneurs by Royal Appointment! The invitation reflects the growing importance of economic benefits of supporting Mumpreneurs in their business endeavours, women who build and run businesses alongside raising a family in their business endeavours. The Mumpreneurs Networking clubs Bus tour was the culmination of months of work to take on the road the biggest and boldest, one stop business solution shop for the U.K’s Mumpreneurs . The spring tour was sponsored by .uk and was the first time that NatWest had ever loaned their bus to third party. 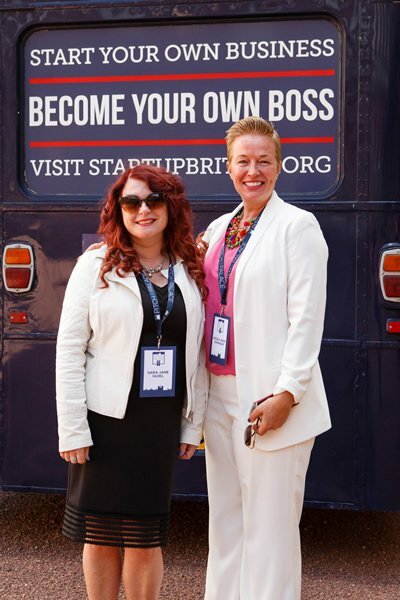 The bus tour drew big crowds of Start Up’s and SME’s all looking for advice and support from the experts and advisors on the bus. At one of the stops there was even a 100 strong flashmob to entertain attendees. Sara and Nicky joined 40 other attendees to hear The Duke of York talk about the support for his ‘Pitch top Palace’ initiative for budding entrepreneurs. The Mumpreneur economy (businesses run by mothers with children under 18) generated £7.2bn for the UK economy in 2014 supporting over 200,000 jobs. That figure is predicted to rise to £9.5bn by 2025 according to research carried out by EBay. The Mumpreneurs Networking Club has had over 20,000 visits to their events and it is their mission to connect, inspire and engage mumpreneurs nationwide thus making their contribution to the UK Mumpreneur economy. Case studies show that most Mumpreneurs had successful careers before having children but decided to not go back to the rat race (with the gender pay gap at 14% more for men according to the Office of National Statistics) but to start up a business using their skills, drive and tenacity, and the proof is in the pudding with the figures that Mumpreneurs contributed £7.2bbn of the UK economy in 2014.